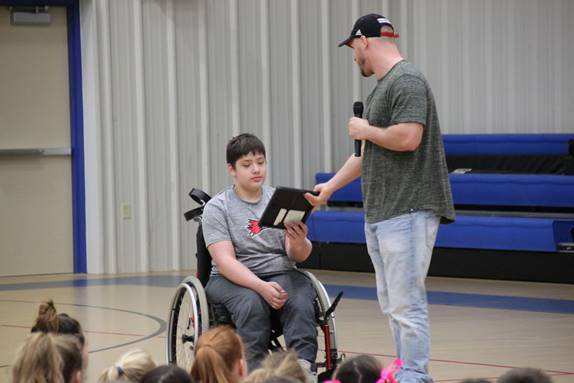 Bonne Terre native and Washington Redskins Linebacker Will Compton presents North County Intermediate Student Brett Forbes with a special award. Bonne Terre native and Washington Redskins Linebacker Will Compton visited North County Intermediate Thursday afternoon to present one student with a special award. North County Principal Melanie Allen introduced North County Intermediate student Brett Forbes and explained he had been nominated for an award by Strategy Specialist Katty Logan a couple of months ago. “A month or two ago Brett was nominated for the 'Yes I Can Award' and this is a big accomplishment,” said Allen. The Council for Exceptional Children recently selected 12 students out of 68 submissions to receive "Yes I can" awards. These awards annually recognize the accomplishments of children and youth nationwide with exceptionalities (ages 2-21). It selects winners for their outstanding achievements in one of six categories: Academics, Arts, School and Community Activities, Self-Advocacy, Technology, and Transition. Brett was recognized for his outstanding achievement in School and Community Activities. Allen said every day this young man does the best he can do and he doesn’t let his physical challenges hold him back from doing what he wants to do. It came as no surprise to his family when he asked when he could start playing basketball. Brett started basketball when he was in kindergarten and hasn’t stopped. Allen stressed Brett always does his best no matter what obstacle stands in his way. His dream is to play at the collegiate basketball level one day. Compton told the students he was really honored to be there to give this award to Brett. Compton said this is a perfect example of adversity. He praised Brett for doing things he was probably told he would never do. He indicated he admires Brett for fighting every day to do the things he loves to do. A loud rumble of applause echoed through the gym as everyone clapped their loudest for Brett and his accomplishments. Brett's mom, Beth Forbes, said they went to Fort Wayne, Indiana, last weekend for a wheelchair basketball tournament and his team beat the number two nationally ranked team in the nation.